Liverpool academy defender Tom Brewitt believes the opportunities to breakthrough to the first team have become more apparent under Jurgen Klopp. Brewitt, who has been a part of the under-23s squad this season, hopes to follow in the footsteps of his young teammate in 2017/18. Klopp has handed debuts to 19 players since taking over Liverpool in October 2015 and the vast majority of those have been academy players. As well as Alexander-Arnold, youngsters Ben Woodburn, Harry Wilson, Ovie Ejaria and Marko Grujic have all made their bows this season, while Sheyi Ojo was handed two appearances in the FA Cup in January. There was also a place in the squad for 17-year-old Rhian Brewster in Liverpool’s Premier League clash against Crystal Palace last month. Brewitt captained the Reds’ under-18s last season and has risen through the ranks of Liverpool’s academy and he now features for the under-23s. However, the young centre-back has had to compete with the likes of Mamadou Sakho, Tiago Ilori and Joe Gomez for a place in the starting XI this season and has therefore struggled to gain regular game time. Brewitt enjoyed more success since the turn of the year, though, and was recently on the scoresheet as the Reds under-23s recorded a 6-0 victory over Rochdale to reach the final of the Lancashire Senior Cup. This Is Anfield caught up with the 20-year-old at the Liverpool Player Awards last week and the England youth international revealed his aim for next season was to make the jump into senior football. “It’s been a tough season for me in terms of the lack of minutes but I think every time I’ve played I’ve done myself no harm,” said Brewitt. “It’s all about just taking the opportunity whenever I can and hopefully this season I’ve shown I’ve been able to do that. “There’s definitely a pathway to the first team under Jurgen Klopp. He’s proven that with Trent (Alexander-Arnold,) Ben (Woodburn,) Harry (Wilson,) Sheyi (Ojo,) and Ovie (Ejaria) and the list that goes on. “The lads that have gone in have done themselves no harm either and they’re progressing really well and are now around it all regularly. “For me, I want to be able to push into men’s football now. That’s the next step for me in the new season and will be my aim. “That’s certainly going to be a challenge but I’m looking forward to it and I’ll see where that takes me,” he added. Brewitt believes Alexander-Arnold deservedly picked up the Young Player of the Year award and claimed the versatile right-back has made an impression this season. 18-year-old Alexander-Arnold was named on the bench for Liverpool’s Premier League opener against Arsenal before making his debut in the 3-0 victory against Middlesbrough in the League Cup in December. The youngster was then thrust into the starting line-up for the crucial Premier League clash against Manchester United a month later and he has gone on to notch up seven appearances for the first team this season. As well as impressing within the first team, Alexander-Arnold has produced a number of eye-catching displays while on international duty for England’s under-19s, causing Brewitt to sing his praises. 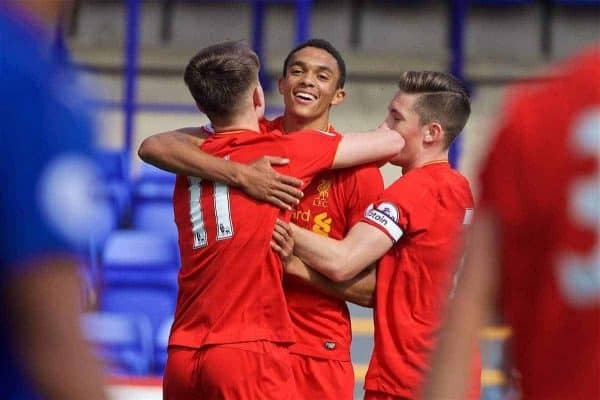 “All the talk around the academy is how brilliantly Trent (Alexander-Arnold) has gone on and performed this season,” said Brewitt. “Not only has he gone into the first team and done well; he’s looked a really good player on the pitch and hasn’t looked out of place at all. Alexander-Arnold’s rapid rise to the first team has provided hope for a number of academy stars like Brewitt and with Liverpool’s defence still attracting plenty of criticism, the centre-back will look to try and make a breakthrough within the next few seasons. He has not ruled out a potential loan move though so Brewitt may have to wait a little longer before he is given an opportunity to stake a claim in the first team squad.